Pancho Jiménez holds an MFA in Sculptural Ceramics from San Francisco State University, and his BA degree from Santa Clara University. He has exhibited extensively in the San Francisco Bay Area and nationally at universities, private galleries, and in civic spaces. His work is part of numerous private and public collections including the permanent collection at the Crocker Museum of Art in Sacramento, the Autry Museum in Los Angeles, the Triton Museum of Art in Santa Clara, and at the University of San Francisco and Santa Clara University Jesuit Community. 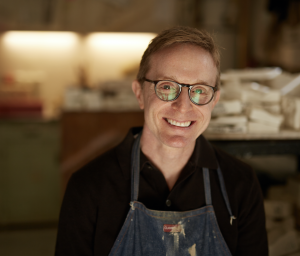 He has been featured in Ceramics Monthly and numerous publications including, “The Ceramic Design Book,” “Extruded Ceramics,” “500 Ceramic Sculptures,” and “500 Figures in Clay Vol. II.” He has held artist residencies at Mission Clay Company and Annie Glass. He has taught courses at San Francisco State University, West Valley College and is currently a Senior Lecturer at Santa Clara University where he has been teaching since 1999. Lissa Jones comes from a fine arts background with an emphasis on site-specific installations. She worked on the Ties That Bind project through MACLA and the Japantown Mural Project. Lissa continues her involvement and support of the art community, exemplified by her years working at Arts Council Silicon Valley.